Charles S. Roberts, a man who is arguably the most important figure in Hobby Gaming, died on August 20th, 2010 due to complications of emphysema and pneumonia. Roberts was the founder of the Avalon Hill game company, a company that was once a giant in Hobby Gaming. The Baltimore Sun has an extensive, though also error riddled, obituary regarding Roberts and his impact as a game designer and as a historian. High on the error list is the assertion that Roberts sold Avalon Hill to Parker Brothers in the 1960s, when the truth is that Monarch Publishing -- Avalon Hill's chief creditor -- took ownership of the company in 1962. Roberts' impact on Hobby Gaming is undeniable. Were it not for the publication of Roberts' game Tactics in 1953, it is unlikely that there would have been the "Castles and Crusades" society that led to the creation of Dungeons and Dragons. It is possible, as there was miniatures gaming without Avalon Hill, but given the fact that the original D&D books recommended the ownership of Avalon Hill's Outdoor Survival for use in "Wilderness Adventures" it is clear that Gygax was influenced and inspired by Avalon Hill. Gygax also wrote articles in Avalon Hill's The General magazine and viewed Avalon Hill and SPI as two of his chief rivals early in the hobby, but that is another discussion. Hobby Gaming is more that role playing games, it includes Eurogames and games like Battlelore and Formula D.
Modern wargaming on boards, as a hobby, can be traced to one man and one game. 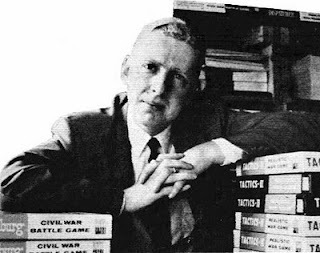 In 1953, Charles S. Roberts, a young man in his early twenties, combined an interest in the military and in history to produce a game, which he designed in his spare time, called Tactics. The Avalon Hill Company was not founded for the primary purpose of producing wargames. This point is often ignored by those in the hobby who have come to look at Avalon Hill as a source for games. Its true purpose is, and remains, to produce the broad spectrum of adult games for which Roberts felt there would be a market. Roberts felt that the big game publishers, Parker Brothers, Milton Bradley, and the like, had ignored the adult game field and he was determined to take advantage of their indifference. Roberts saw adult games as a field to be exploited and fertile soil for a hobby. He was right. As modern adult games like The Settlers of Catan, Small World, Pandemic, and Tide of Iron, as well as classics like Squad Leader, Gettysburg, Facts in Five, Acquire and Diplomacy, ably demonstrate. Gaming had room to expand into a grand hobby, and it has done so. A quick visit to BoardGameNews.com and a glance at their Gone Cardboard link presents a glimpse of the Hobby games coming out this year. There is a breadth of theme and a breadth play styles represented. This comes as a natural descent from Roberts' original mission. 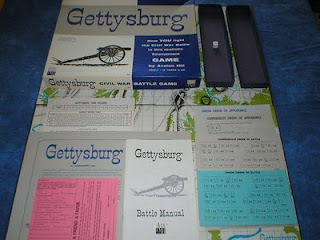 According to Wargame Design, of the eighteen titles published during the Roberts era "nine are non-battle titles representing such diverse fields as law, commerce, and sports." Due to a number of errors in his approach, Roberts eventually ended up in trouble with his creditors. One of these creditors, Monarch Publishing, took over Avalon Hill and continued publishing games. In fact, the company expanded a great deal under the new leadership. Unlike many brand purchases in the gaming industry, Monarch didn't cherry pick a few old titles and forget the rest. Instead, they continued in the mission set forth by Roberts and produced a wide variety of games for the adult gaming market. They also published a magazine, The General, which served as a way to promote and support their existing line of games. Though Roberts no longer ran Avalon Hill, his contribution to the creation of a hobby was solidified by the success of his legacy. In 1975, at the first Origins gaming convention, the first Charles S. Roberts awards were given out to games within the hobby. The winners (games published in 1974) were, Third Reich, Manassas, Strategy and Tactics Magazine, Albion Magazine, and a Hall of Fame Award for Charles S. Roberts himself. For years to come, the Charles S. Roberts Award was a part of the annual Origins Awards and winners included Gary Gygax, Dave Arneson, The Space Gamer Magazine, and Car Wars. The Roberts Awards have typically gone to board and wargames, with other Origins categories covering other aspects of hobby gaming. 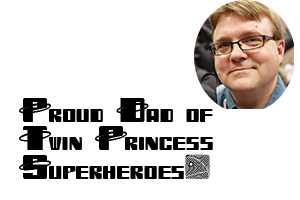 In recent years, the Charles S. Roberts Award has been handed out at the World Boardgaming Championships -- a fact that highlights both the growth and the fracturing of the gaming hobby. Other than my gratitude for Roberts contribution to Hobby Gaming, I have no connection to him or to Avalon Hill. Like most of the grand masters of the hobby, I never had a chance to meet him and wish that I had. I am credited with doing some proofreading work on a game (Zulus on the Ramparts! that won a CSR Award this year, but that is a pretty tangential connection. I would like to thank GROGNARDIA: RIP Charles S. Roberts (1930-2010), and Greyhawk Grognard: R.I.P. Charles S. Roberts for sharing this sad news. As a gamer, I have recently begun collecting books about the hobby and copies of the games that created the hobby. 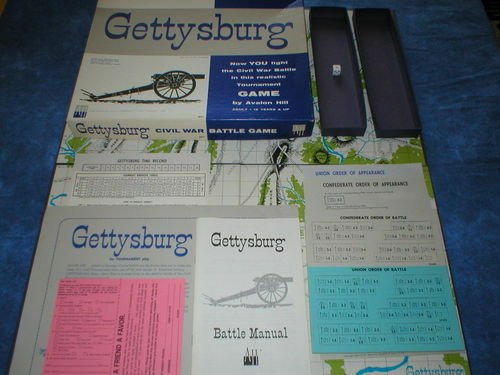 Maybe I'll crack open my copy of Gettysburg -- square spaces and all -- and play a game in remembrance of one of the founders of Hobby Gaming. A fine tribute to Charles Roberts, Christian. Yes, he was the man who started wargaming and ultimately roleplaying in this country. Thanks for a great article. Linked!